In a nutshell: Kama’ole is a very popular set of beaches for locals and visitors. Beautiful, long, 1.5 mile sandy beaches with incredible views of Molokini, Kaho’olawe and Lana’i islands. 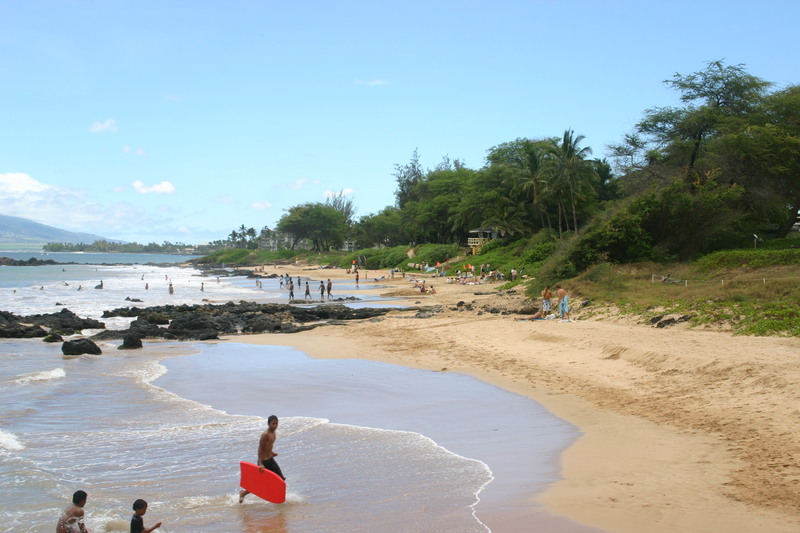 Kam III has one of the most regular South Maui shorebreaks for boogie-boarding. Snorkeling opportunities are plentiful. Full facilities and family friendly. Minuses: Kam III is crowded on weekends and holidays and sometimes less-than-desirable types make the grassy areas a drinking hangout. 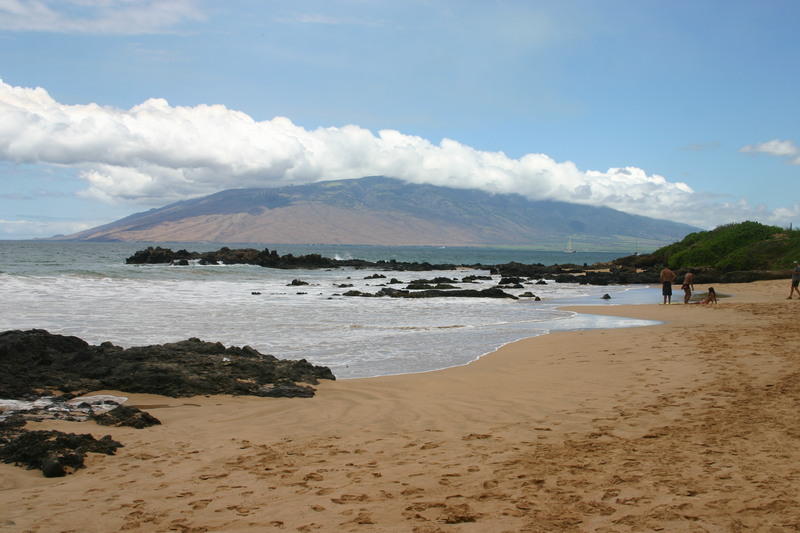 Kama’ole Beach Park is a set of three popular stretches of beach smack in the middle of Kihei. Frequently called by their shortened nicknames (“Kam I”, “Kam II” and “Kam III”) they are all well marked, easy to find, and right on South Kihei Rd. Besides being in the middle of the action, these beaches are very popular due to an unbeatable combination of accessibility, facilities, and just plain old really nice beaches! 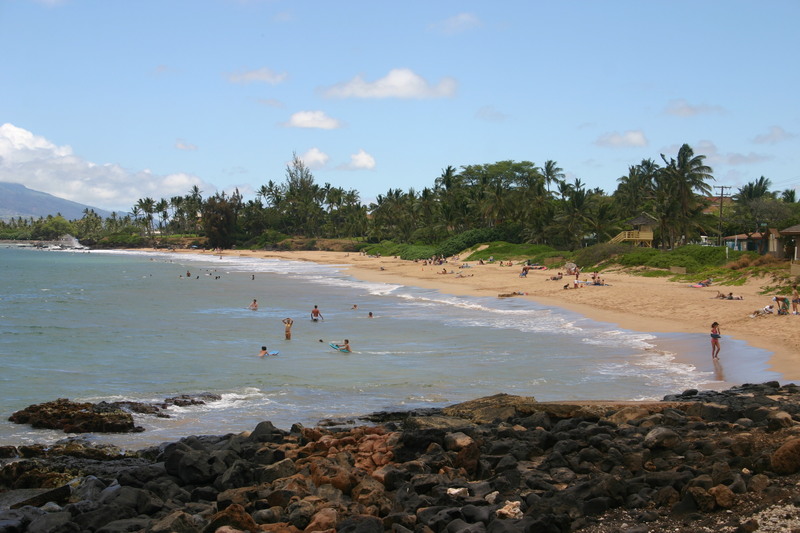 The area at the North end of Kam I (which is called “Charley Young Beach” by locals) is the best area for snorkeling. Snorkeling is also pretty good at all of these beaches. Stick around the rocky points for the best snorkeling. A wide, sandy beach, with good swimming. The north end of this stretch of beach is called “Charley Young Beach.” Charley Young was a military reporter who came at the wrong time to build his house here – during WWII all these beaches were taken over and made to simulate enemy beach landings. Anyway, Charley got his land back after the war, and built his house. The Charley Young end of Kam I is more popular with locals, and since the lifeguard and more visible parking and beach access for Kam I is at the other end of the beach, Charley Young is not usually as crowded with visitors. The Charley Young parking lot is on Kaiau St., as is a public access path and stairs to that end of the beach. Facilities: Each has Showers, Bathrooms, Lifeguards, BBQs & Picnic Tables. When and Where could I see turtles in one of those beaches ? What is the best time of year for boogie-boarding these beaches? Is there a bad time? Are one or more seasons more favorable? Its good year round, but summer can bring more frequent larger south swells – depending on your ability and the swell size that may be quite desired or too much! What is the length of each of the Kam beaches? Are these beaches a good place for whale watching in February? My wife and celebrated our 30th anniversary in 2006 a Maui Coast Hotel and enjoyed this pristine piece of God’s creation and then again for our 40th anniversary this January, 2016. This beach is a top-of-the-line, most beautiful places we’ve experience. 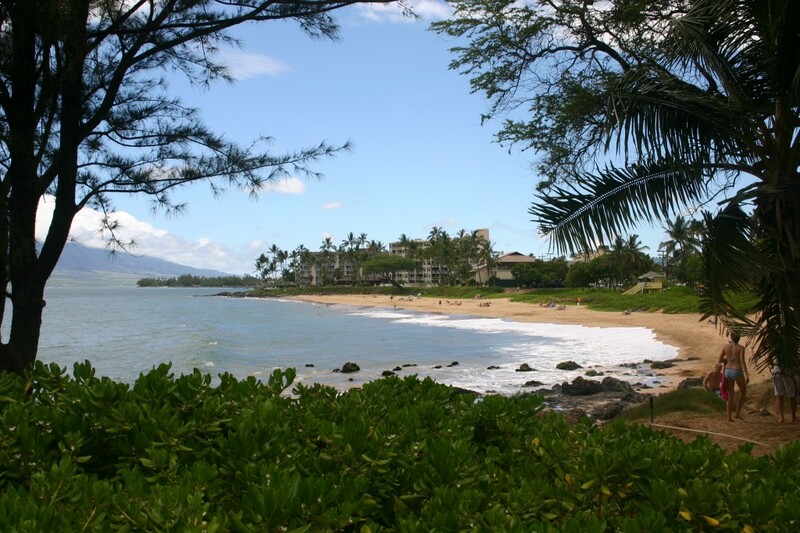 as a long-time resident of south kihei and a daily lover of kam one and especially charley young, i concur with everything the author of this website has to say and the only thing I can add is the beautiful nature of francolin birds making their lovely morning sounds while the beach morning glory vines grow silently while unfolding their purple flowers as the morning dew dries in the rising warmth.